Printing on rigid and flexible materials, with high resolution. The digital printing we made, ranges from adhesive to rigid panels. We use Roland eco-solvent printing systems with which we make prints on adhesive, paper and reel materials, with bright and long-lasting colors and rigorously high resolution. As for the objects then, we have recently included in the production cycle, the new and revolutionary Roland LEJ640B, versatile printer that uses UV inks, or instantaneous drying on countless materials, this allows you to customize your objects with bright and lasting colors over time. We print rigid materials with UV inks, plates, panels and objects with thickness up to 25cm, printed in four colors, white and paint, they are our flagship, yes, personalization through direct printing allows us today, to brand your world, the printer also prints on materials not treated directly on the reel, the same fact uses a carpet to drag the objects to be printed, this feature makes it unique and allows us to print without limits to high resolution on the most unthinkable things, it is an example the cutter that you see here on the side in the picture, yes, the cutter was printed directly from our digital printer with photographic quality. We print on wood, leather, plastic panels, marble and stone, sheet metal, alucobond, glass, plexiglass, polycarbonate and so on and so forth. The high resolution digital printing is now a reality, even on dark supports, we also print with white color and we create exceptional finishing effects with gloss and matt paint. Digital printing, is a technique that allows you to decorate virtually any support and "inking" various types of materials: starting from paper, passing through the PVC adhesive of various qualities, coming to the painting. We use Roland® systems with large format printers and eco-solvent inks that we use in Avery® support products. We take your images to heart: this means that we will never print anything that could disappoint you, that's why every time our graphic studio makes proofs of color and tare the printers in the best way, in order to make particularly exciting photographic images. Moreover, this type of inking is resistant to bad weather (variable depending on the substrate) and lasts over time, penetrating into the printed material. Digital printing has another advantage that allows you to print high quality prints even with very low runs. 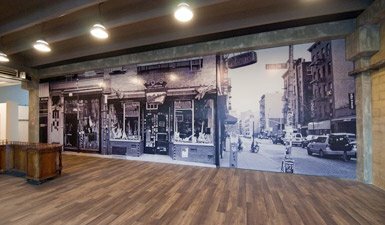 What's better, to customize the premises of your company, a wall entirely printed with a large format image? Thanks to modern digital printing technologies we can print high quality photographic on adhesive films, paper or wallpaper, whatever you want.